In 1991, the U.S. Postal Service (USPS) issued a stamp depicting the now on-again, off-again planet Pluto with the inscription "Not Yet Explored." Now, the team behind NASA's first mission to the last planet wants to correct that record with a stamp of their own. Launched in January 2006, NASA's New Horizons robotic spacecraft is set to flyby Pluto and its moons in 2015. It is now more than two billion miles (3.2 billion kilometers) from Earth — beyond the planet Uranus' orbit — and since December, has been the closest probe to come near the icy dwarf planet. "We're now in new territory as the closest any spacecraft has ever gotten to Pluto, and getting closer every day by over a million kilometers," said Alan Stern, New Horizons principal investigator at the Southwest Research Institute. Roused from hibernation for several weeks last month for a battery of system and experiment tests, New Horizons is in the "late cruise" phase of its journey. Its team at John Hopkins University's Applied Physics Laboratory in Maryland is preparing the probe for its final stages leading up to the flyby and closest approach to Pluto. Timed accordingly, the mission team launched a petition campaign Wednesday (Feb. 1) for the U.S. Postal Service (USPS) to commemorate the New Horizons on a stamp. The online petitionis directed at the USPS and its Citizen Stamp Advisory Committee (CSAC). The latter has been tasked since 1957 with evaluating the merits of all stamp proposals. "Subjects should be submitted at least three years in advance of the proposed date of issue to allow sufficient time for consideration and for design and production, if the subject is approved," the CSAC states on the U.S. Postal Service website. "We're asking people to sign the petition, because the post office considers not just the merits of a new stamp proposal, but also whether it is supported by a significant number of people," Stern said in the announcement for the petition campaign. "This is a chance for us all to celebrate what American space exploration can achieve though hard work, technical excellence, the spirit of scientific inquiry, and the uniquely human drive to explore." The stamp would commemorate more than New Horizons becoming the first spacecraft to study Pluto. "The Pluto flyby will represent the first exploration of the Kuiper Belt, the first exploration of a double planet, the first exploration of an ice dwarf planet, and the farthest object ever explored in space," the petition reads. Accompanying the petition, the New Horizons team also debuted a concept for the stamp by Southwest Research Institute scientist and artist Dan Durda, whose works have appeared on the mission's website and other venues. Durda's stamp shows New Horizons passing by Pluto with the planet's moon, Charon, in the background. Durda's artwork however, is just for illustration. Citing the demands of stamp design and reproduction requirements, it is USPS policy not to accept unsolicited artwork. Whether or not the New Horizons team is successful in getting the USPS to honor their spacecraft's mission, the probe will have delivered a stamp to Pluto. On New Horizons, together with eight other mementos, is one of the 1991 "Not Yet Explored" Pluto stamps. "Pluto may not have been explored when that stamp set came out, but we were going to conquer that," Stern told collectSPACE.com in a 2008 interview. "I wanted to fly it as a sort of 'in your face' thing." That stamp was issued as part of a series that honored robotic space exploration of the planets. In the decades since, the USPS has released postage commemorating NASA's Mars Pathfinder and the Pioneer 10 planetary missions, as well as — most recently — the Messenger mission to Mercury, which was depicted on a stamp last year. 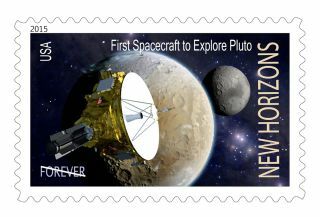 Click here to read or sign the Pluto stamp petition"Honor New Horizons and the Exploration of Pluto with a USPS Stamp."